Posted on 15/01/2018 at 05:53 PM. Saturday was my first day on the water since returning from over seas. Started the morning looking for kings around the hulls and markers while my boy was testing his new stick baits he got for Christmas. 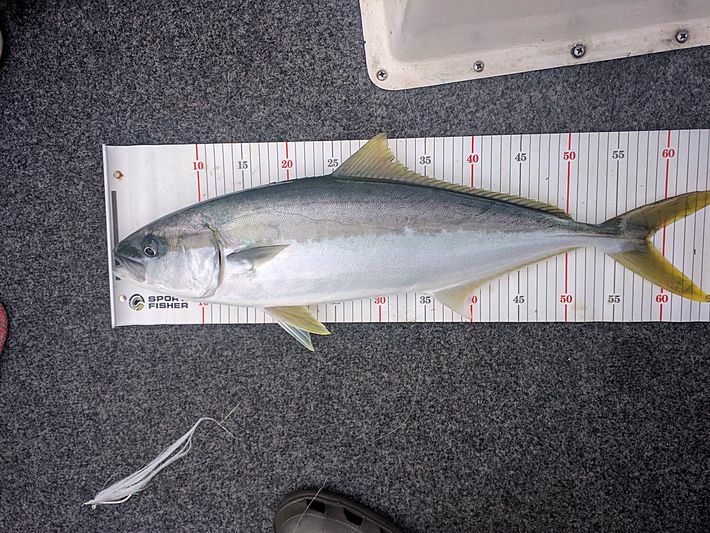 He just started trying out a sinking version on one side of the boat (they have a crazy action) while I hauled my line of the water to throw a clouser down the length of a hull. Good thing I ripped it off the water fast enough or one of the two kings who wanted a piece of it would've hooked up! They were determined not to miss out and charged off under the boat, I think, trying to catch the fly at the end of the back cast. Fortunately, the stick bait was doing it's crazy action thing on that side of the boat and got duly smashed. A lively battled ensued which ended prematurely with the sickening sound of line snapping. The braid to leader knot had failed despite some serious pressure testing the night before. We just didn't test it for sudden jerks like king fish tend to dish out. Spent the next two hours (I kid you not ) trying to join the leader to the braid without it snapping with erratic pulls. Tried everything I knew multiple times. Eventually, 2 loops with a 6 turn cats paw between them did the trick. It was ugly but it held. (I've subsequently discovered the FG knot courtesy of YouTube). With tackle issues resolved we headed out to try find some kings. Passed some surface action on the way. Bonnies (I presume) jumping clear of the water and we saw a salmon caught as well. We found a patch of kings on the chew down deep and had a great time being smashed a good few times but landed some nice fish too. Eventually the slop got us sea sick (think the tablets wore off) and we had to leave them begrudgingly. Nice way to get back and soften the blow of the end of the holiday. Posted on 15/01/2018 at 05:56 PM. Posted on 15/01/2018 at 05:59 PM. Posted on 15/01/2018 at 06:04 PM. Saturday was the 13th, wasn't it? Posted on 15/01/2018 at 06:50 PM. Good session Martin and great to see your boy getting the fishing bug. Fyi on the leaders. We have found the fg knot to be good in very heavy leaders but not reliable for the lighter leaders under 30lb as they tend nto to slip off atfer multiple casts.. Hopefully you have more luck with them. For my kids we use 3 or 4 turn surgeons in anything from 6lb upto 60lb. With the surgeons knots if I dont pull them up really tight when lubed ad tied I find they sometimes bust. Another great join is the Aussie quickie but it needs a Bimini for 100% reliability. Hope this is useful Martin. Posted on 21/01/2018 at 05:47 PM. Couple of thoughts on the braid to leader connection (for spinning application). With the FG knot (which I use a lot), in addition to the advice by TH about not using it for light leaders, a big issue is the final set of half hitches usually prescribed to secure the tag end - they are made over the main line - and while being pulled tight they can cause sharp bends in the fibers of the main line, weakening it considerably. The problem is worse on thinner braids. So there is a newer version of the FG that still uses half hitches to lock over the leader bit but finishes with a uni-knot over the main line - when you snug that down it doesn't create the same damaging small radius kinks in the main line. PS I'm OS atm, love to catch up when I'm back. Posted on 22/01/2018 at 07:30 AM. 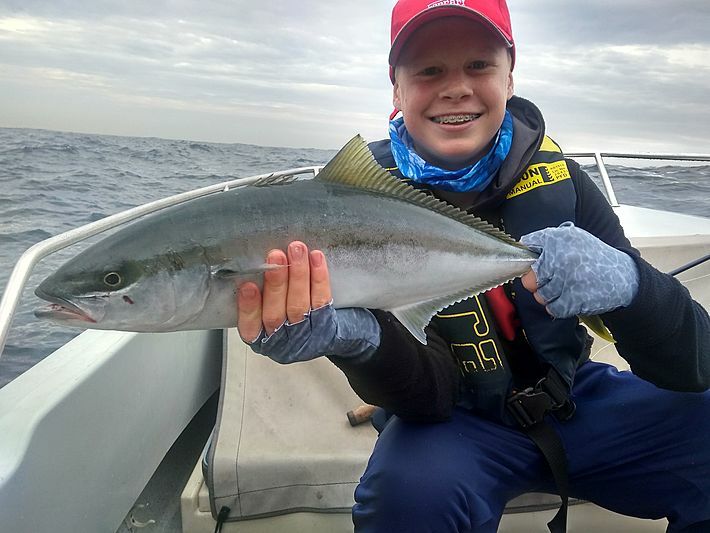 Great report Martin.... always great to see kids get onto fish with their dad's. My daughter absolutely loves it. 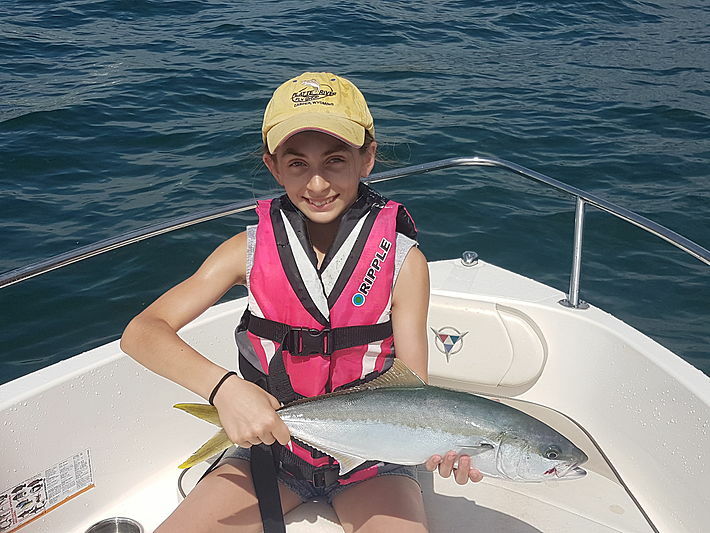 Got her first kingie, salmon and bonito this summer. She could spend all day on the boat with me. Posted on 22/01/2018 at 04:02 PM. Posted on 24/01/2018 at 03:07 PM. Thanks for knot tips guys. Being doing a fair amount of testing. The FG knot on 30lb Fireline to 20lb FC Rock fluro seems to hold pretty well. With all other knots, the braid cuts the fluro (and 20lb Jinkai for that matter) at the end of the knot closest to the hook. We have a 6lb Fireline to 12lb setup where a Uni to Uni works great. William, the swivel idea was something I contemplated on the water but just reckoned it was going to get reeled into the rod tip. The only downside is it reduces the length of the leader you can use. I look forward to catching up when you're back. George, hope the kids get the fishing bug for life!! Posted on 24/01/2018 at 03:13 PM. You could always put a braided loop on your braid and then do a loop to loop join with your mono. Or 'top shot' your braid with 10+ meters of mono, then tie onto your mono.